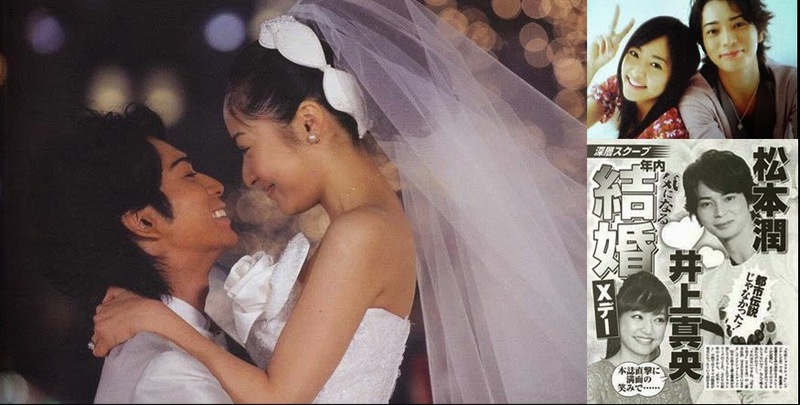 The rumor of the two having matching rings, the time when the two were discovered visiting Shun Oguri's place as a couple, the speculations of Jun Matsumoto(松本潤) (30) and Mao Inoue(井上真央) (27) dating each other have been whispered for some time now. In the latest issue of Shukan Josei magazine released on May 13th, 2014, it is reported that the two has a plan to get married within the year. The fact that they are dating is no longer a "urban legend" anymore but when will they go public with their relationship? In the magazine, it covers the sighting of the two's secret date at a yakiniku restaurant in Shibuya. In regards to "wedding date", it is said it will be determined after the filming of Inoue's starring NHK taiga drama series "Hana Moyu(花燃ゆ)" set to broadcast in 2015. There is no doubt that if the two are going to host the upcoming NHK's Kohaku Uta Gassen, they will announce the marriage at that time. "Ever since the two co-starred in the drama series Hana Yori Dango(花より男子) in 2005, fans were already suspected that MatsuJun and Inoue were dating. Also, it was revealed last year that Mari Kagaya(加賀谷真理), the PR person for "Ralph Lauren Japan" was introduced to MatsuJun and Inoue when she was at Mr. and Mrs. Oguri's place. In January of this year, one weekly magazine had decisive pictures of the two dating. After Johnny's intervened, it was reported that the supposed images of the two dating were replaced with gravure pictures of everyone from Arashi." With Matsumoto as the member of one of the most popular groups in Johnny's, the agency is doing everything they can to stop the relationship from going public and to break up the two love birds. "After the reports of Matsumoto dating were out, reporters were gathered in front of Inoue and his houses. Matsumoto was quickly forced to move into a luxury apartment with heavy security under the instructions of the agency. There's no sighting of the two since then. With the yakiniku restaurant outing reported by "Friday", Toma Ikuta(生田斗真) (29) was also in attendance. In the current state of things, it seems they are trying to avoid meeting alone in secret." If the two love birds want to continue dating, it is better if they are more careful. When Kazunari Ninomiya(二宮和也) (30) and Nozomi Sasaki(佐々木希) (26) were discovered dating, officials from Johnny's immediately came out to the press and explained the two have parted ways. There's no way Matsumoto can maintain the status quo. With the current stage, they are setting themselves up for a forced breakup by the agency. Just get married already, you two. moi ce que je comprend c'est pourquoi il n'aurai pas le droit à une relation tout sa parcequ'il sont dans le groupe des johnnys. Je pense pas que si il avait une relation que il aurai moin de fan . En tout cas moi quoiqu'il arrive je serais toujours fan de ARASHI . Johnny Entertainment is indeed a stupid agency!